For the first time, scientists have shown that ocean warming has had a global impact on the mix of species caught by fishermen. Previous studies indicated that some species are shifting location in response to temperature increases, with fish gradually moving away from the equator into cooler waters. However, research published in May 2013 in Nature shows that species from warmer waters have also been replacing those traditionally caught in many fisheries worldwide at least since 1970. Dr. William Cheung of the University of British Columbia and his co-authors used the temperature preferences of fish caught around the world to determine the relationship between fisheries catch and ocean warming. They first assembled data on the distribution of 990 marine fish and invertebrates. They assigned each species a temperature preference based on the average sea surface temperature in areas where that species was predicted to have occurred between 1970 and 2000. Next, to measure changes in the composition of marine fisheries, the researchers compiled data on the tonnage of each species caught in the 52 marine ecosystems that account for most of the world’s fisheries. Then, for each ecosystem and each year from 1970 to 2006, they calculated the average temperature preference of the species, weighted by the amount caught. 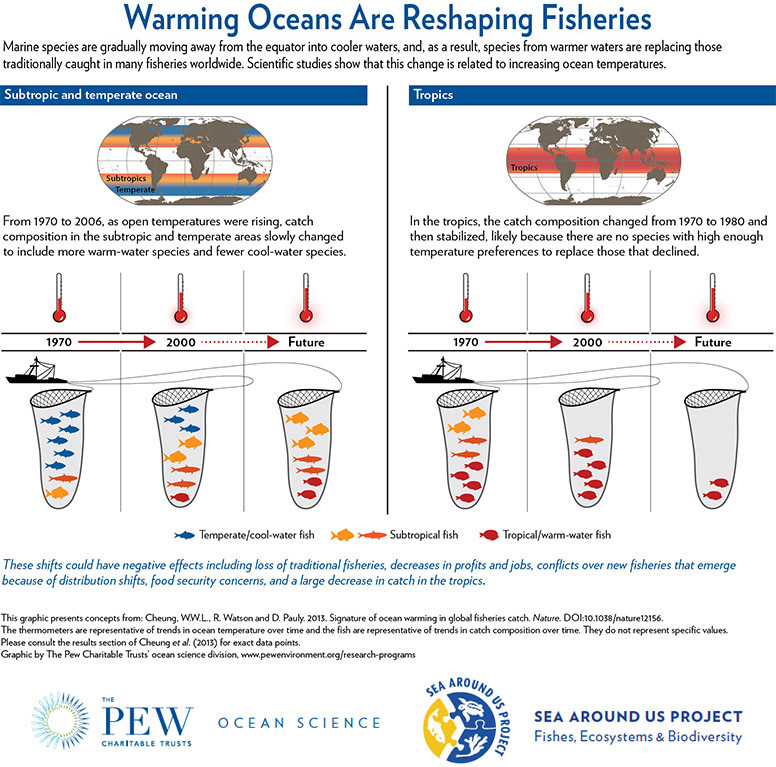 Finally, the researchers determined the connection between ocean warming and changes in fisheries catch by using a statistical model that separates out other factors, such as fishing effort and oceanographic variability. The authors found that, except in the tropics, catch composition in most ecosystems slowly changed to include more warm-water species and fewer cool-water species. In the tropics, the catch followed a similar pattern from 1970 to 1980 and then stabilized, likely because there are no species with high enough temperature preferences to replace those that declined. Statistical models showed that the increase in warm-water species was significantly related to increasing ocean temperatures. Cheung, W.W.L., R. Watson and D. Pauly. 2013. Signature of ocean warming in global fisheries catch. This entry was posted in news and tagged fisheries, Warming ocean. Bookmark the permalink.